I know a woman who turns up her nose at vegetables in baked goods. Sweet potato pie and pumpkin cheesecake would never touch her lips. No doubt, she’d push her plate away at fruit tucked into savory dishes, too. If only she knew what she was missing. Apples with Cornish game hens. Pears with pork. Duck with cherries. And of course, apricots with chicken. There’s just something magical about the slightly sweet, softly rounded flavors of fruit in a main dish. “Sara’s Persian Chicken” perfumes chicken thighs with cardamom, cumin, cinnamon, ginger, saffron, and dried apricots. It’s akin to a classic chicken tagine, but this recipe from “Braises and Stews” (Chronicle Books) by Tori Ritchie takes a little less effort and time. I love to serve it with couscous. Just follow the directions on the box of your favorite brand of quick-cooking couscous. I like to cook it with chicken broth instead of water. Sometimes I’ll throw in a pinch of saffron, or not. After it’s cooked, and has steamed to a fluffy texture, I’ll add half of a chopped preserved lemon, some minced chives, and a handful of toasted pine nuts. For a more substantial side dish, stir in some canned, rinsed and drained chickpeas, too, if you like. Together, they make for a most satisfying supper, and one that doesn’t require that fruit secede from your dinner plate. Rinse chicken and pat dry. In a small bowl, mix together cardamom, cumin, cinnamon, and salt. Sprinkle hafl of the spice mixture over chicken. coat bottom of a 5- to 7-quart Dutch oven with a thin film of oil and set pot over medium-high heat. When oil shimmers, add enough chicken to cover bottom in 1 layer. Cook, without stirring, utnil chicken lifts easily from pot with tongs and is browned on bottom, about 5 minutes. Turn pieces over and cook until they brown and release easily on the other side, about 5 minutes more. Transfer browned chicken to a plate. When last batch of chicken has been removed, add onion, garlic, and ginger to pot and cook, stirring for 1 minute until fragrant. Stir in the saffron, cayenne, and remaining spice mixture. Add lime juice and sugar and let come to a boil, stirring to release browned bits. Add broth and return chicken and any accumulated juices to pot. Let liquid come to a boil, then reduce heat, cover, and simmer for 25 minutes. Meanwhile, cut each dried apricot in half. When chicken has cooked 25 minutes, stir in apricots. Continue to simmer, covered, until chicken is opaque at the bone and apricots are plump, 10 to 15 minutes more. To serve, splash each portion with a few drops of rose water, if using. I can’t wait to try this interesting Persian recipe! It sounds absolutely lovely! Love the play of the sweet and savory. I had no idea the famous apricot chicken is persian-inspired! Your chicken looks delicious. I like this idea of a simpler tagine. We always put raisins in our couscous. Chopped dried apricots should work there as well. Great picture and the dish looks delish! I love fruit in savory dishes! that woman sounds silly. This looks delicious! This looks absolutely divine! I wonder if I can convince my debaters to make that this weekend. Yum. Carolyn, your comment on my blog about wanting to wrap yourself in the crepe just made my day. I was seriously LOLing! I always love the addition of fruit in savory dishes! 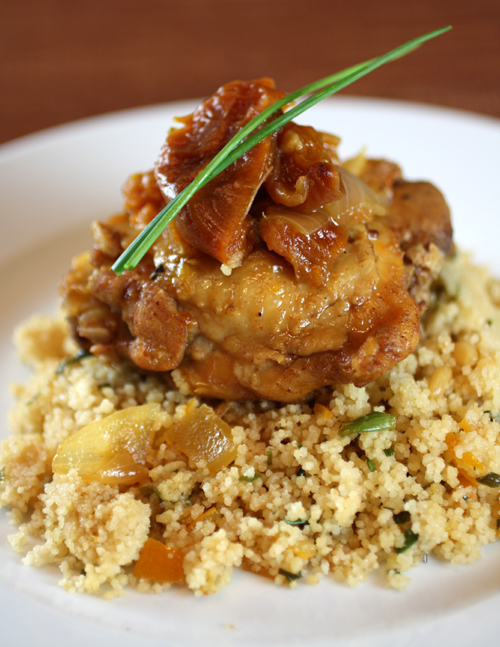 The chicken with couscous and apricot looks excellent! This is something my family would really love! Although my husband is still a bit wary of fruit in savory dishes, I’m definitely a believer! A dish such as this might help him see the light, too. And thank you for reminding me that the accompanying grain needn’t rely on the sauce/gravy/juices of the meat for flavor; I have a tendency to leave rice, etc. plain. I’m missing the opportunity to add more flavors! Mmm, I love fruit in savory dishes. I have an apricot tree in my yard, so I can’t wait for it to produce fruit so that I can give this a try! I lover Persian food and the paring of apricots with the rice and chicken I imagine is sublime. For the folks that do not like fruit in their savory dishes, I bet they forget they are probably eating it with relish quite a bit – every time they have marinara sauce, salsa, etc. those tomatoes and sneaky devils. Oooo this looks wonderful! I love love the balance of sweet and savoury in dishes with fruit in them. I too know someone who won’t eat veggies in sweet things and fruit in savoury things, but I just don’t get it. Their arguements tend to fall apart when you start going into the gray zone fruits/veggies like tomatoes and avocados (which are both technically fruits). That chicken with apricots looks and sounds so good! This was delicious! Made it last night and loved it. Because I live way out in the country I had to tweak it a tiny bit to fit what I had in the pantry, so I used boneless thighs, lemon juice instead of lime and omitted the saffron. I don’t know how much difference it makes but wow, this was so good! Thanks! AnneliaW: So glad you loved the dish. The saffron does add a little something-something. But sounds like it still turned out delicious without it.